Looking for a sweet treat to curb your chocolate cravings? 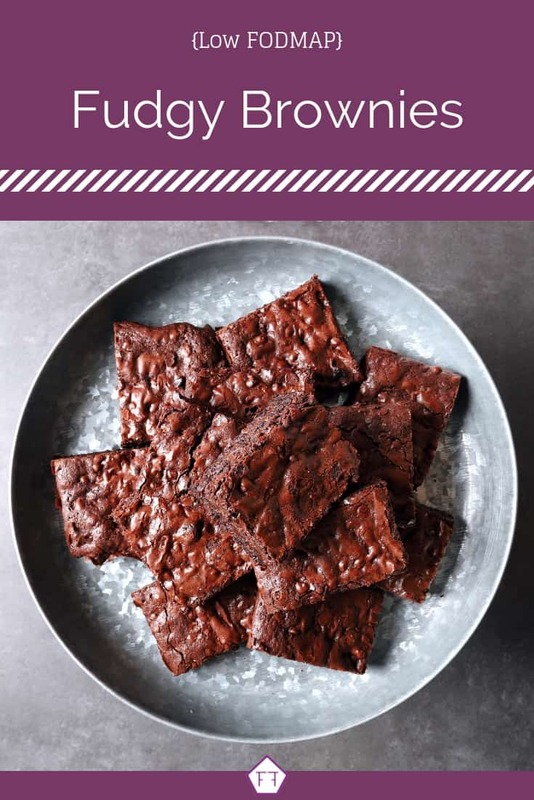 Packed with three kinds of chocolate these low FODMAP brownies are sure to keep your sweet tooth and your tummy satisfied! I made these brownies for the first time at Thanksgiving. My family was traveling, so a friend and I decided to host a tiny party all on our own. I was so upset it took my husband three tries to communicate that this was all a horribly ill-timed dad joke. Apparently, these are the best brownies he’s ever had and he thought that would be obvious. So, the moral of the story is that these brownies are epic and my husband doesn’t get to try new recipes before I do anymore… Hopefully, you enjoy these brownies with a few less tears! Think these low FODMAP brownies sound great, but you don’t have time to try them now? Don’t worry! You can PIN THIS POST for later. Looking for a rich, chewy dessert to tame your sweet tooth? These low FODMAP brownies may be the best thing you’ve ever tasted! Check out the notes below to keep this recipe FODMAP-friendly. First up, dark chocolate! According to the Monash app, dark chocolate is safe in servings of 1 oz. Servings of 3 oz or more are high in lactose, while servings of 4.5 oz are high in both lactose and fructans. Our recipe uses 4 oz of chocolate for 18 brownies. That works out to 0.2 oz per serving. This is well within Monash’s recommended range. Next up, cocoa powder. According to Monash, cocoa powder is low FODMAP in servings of 2 heaped tsp per sitting. Servings of 5 tsp or more are high in both fructans and oligosaccharides. We use 1 cup of cocoa powder, which works out to 2 heaped tsp per serving. This is within Monash’s recommended range. We’ll also be using chocolate chunks. For my North American peeps, Enjoy life chocolate chips and chunks have just been certified as low FODMAP! If you can’t find low FODMAP chocolate chips, don’t panic! There is still a ridiculous amount of chocolate in this recipe! Last but not least, flour. If you’re in the elimination phase of the Low FODMAP Diet, you need to use gluten-free flour. For my Canadian peeps, I’m in love with President’s Choice gluten-free all-purpose flour. 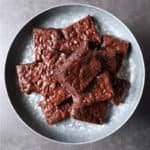 Want to try these epic low FODMAP brownies? Don’t forget to PIN THIS RECIPE for later! Packed with three types of chocolate, these low FODMAP brownies will be the talk of your dessert table! Preheat your oven to 350 F. Line a 9x13" pan with parchment paper (leave some sticking out at the edges for "handles"). Set aside. Combine the butter and 2 oz of chopped chocolate in a microwave-safe bowl. Melt the chocolate in 30-second bursts in the microwave. Whisk the chocolate in between each burst until the chocolate is completely smooth. Then, whisk in the sugar, followed by the eggs and vanilla. Add your cocoa powder, flour, salt, the remaining chopped chocolate, and your chocolate chunks. Carefully fold the ingredients together with a rubber spatula. Make sure to incorporate all the dust crumbs in the bottom of the bowl! Then, pour the batter into your prepared pan and smooth it out with your spatula so it's sitting evenly. Bake your brownies for 30 minutes or until a toothpick comes out with a few crumbs, but no wet batter. If your brownies aren't done yet, check every two minutes until you have moist crumbs on an otherwise clean toothpick. Once your brownies are cooked, remove them from the baking dish and allow them to cool completely on a wire rack before cutting. 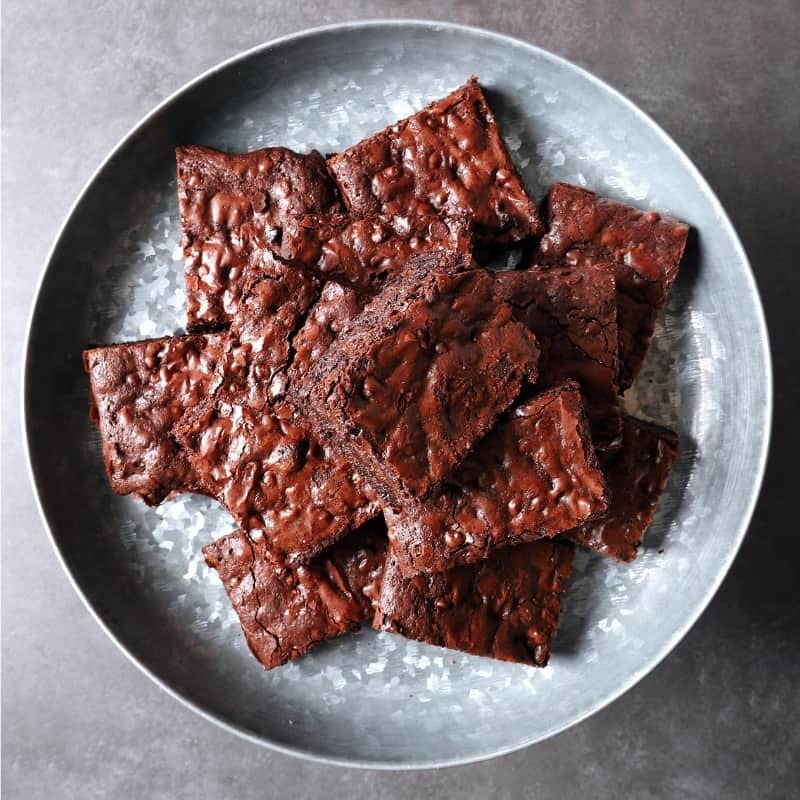 These epic low FODMAP brownies will keep your taste buds and your tummy happy! Did you like this recipe? Don’t forget to share it! Together we’ll get the Low FODMAP Diet down to a science! Low FODMAP Chocolate Chip Cookies Looking for a FODMAP-friendly treat to curb your sugar cravings? These chocolate chip cookies are ready in a flash and happy to camp in your freezer so you always have a treat when you need one. Low FODMAP Chocolate Cupcakes Have a chocolate craving that just won’t quit? These chocolate cupcakes will hit you right in the sweet spot! Low FODMAP Confetti Cake Looking for a kid-friendly dessert idea? Sprinkle a little magic in your next baking project with this adorable confetti cake.